Home » General » United Methodists: Dead sect? Or are we yet alive? United Methodists: Dead sect? Or are we yet alive? published by the Methodist Book Concern, 1923. 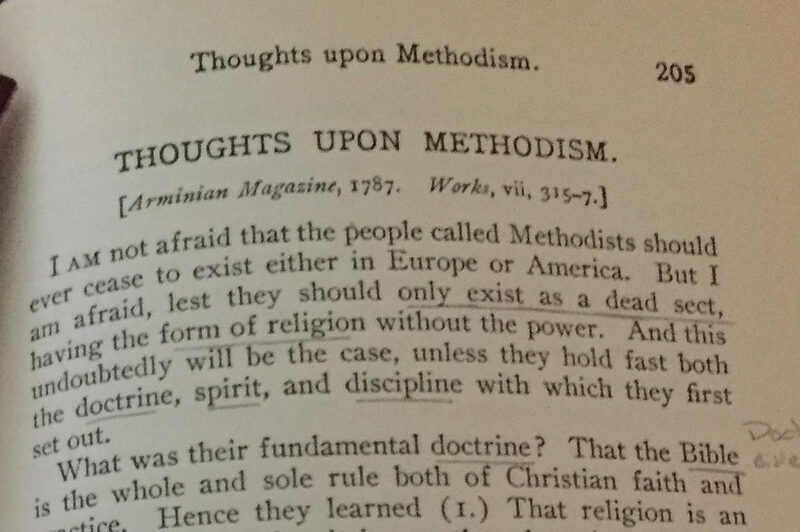 The “dead sect” quote opens “Thoughts upon Methodism,” an article John wrote for the The Arminian Magazine in 1787. He turned 84 that year. He reminds readers of the movement’s humble beginnings, “In the year 1729, four young students in Oxford agreed to spend their evenings together.” He tells about the early days of field preaching in Bristol and how he ended up acquiring the Foundery, an abandoned building in London. Wesley is concerned that one thing could undo this for individual Methodists and the movement as a whole. I fear, wherever riches have increased, (exceeding few are the exceptions,) the essence of religion, the mind that was in Christ, has decreased in the same proportion. For him, it’s all about the money, money, money. Wesley knows that Methodists can accumulate wealth due to their frugality (see Wesley’s sermon “The Use of Money“), and when wealth increases religion decreases. “Hence,” he continues, “they proportionably [sic] increase in pride, in anger, in the desire of the flesh, the desire of the eyes, and the pride of life. So although the form of religion remains, the spirit is swiftly vanishing away” (emphasis added). There is one way, and there is no other under heaven. If those who “gain all they can,” and “save all they can,” will likewise “give all they can;” then, the more they gain, the more they will grow in grace, and the more treasure they will lay up in heaven. When Methodists give, we avoid falling in love with money and becoming a dead sect. In “Thoughts upon Methodism,” our founder seems little troubled by conflicts among Methodists. Instead, he is concerned that we will trade in our fist love of Jesus and one another, what he calls “holiness of heart and life,” for a love of money. The United Methodist Church today is at our best when we heed Wesley’s words. We are at our best when we express our love of Jesus by loving one another. Photo by Mike DuBose, United Methodist Communications. 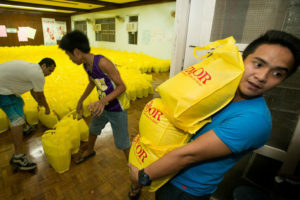 Our United Methodist Committee on Relief is one of the premier relief organizations in the world. We’re often the first to arrive after a disaster and the last to leave. And every penny donated toward relief efforts goes to help those devastated by disaster. Our Abundant Health initiative, which grew out of Imagine No Malaria is changing lives. Together, we United Methodists are improving the health of people all around the world. Local United Methodist churches feed the hungry through food banks and kitchens. We care for children through tutoring programs, backpack programs, and day care centers. We give drinks to the thirsty by drilling wells and caring for water. We watch over one another in love in small groups, Sunday school classes, and UMW circles. We care for the sick as doctors and nurses, through visits to the hospital, and by providing casseroles. We are not a dead sect when we live into rubber-meets-the-road, “plain, Scriptural religion.” When we express our love of Jesus by loving one another, incredible things happen in our communities and around the world. We are yet alive when we remember that we are the church–you, me, all of us. We may not agree on everything, but we all love Jesus. That is the power of religion of which our founder speaks.